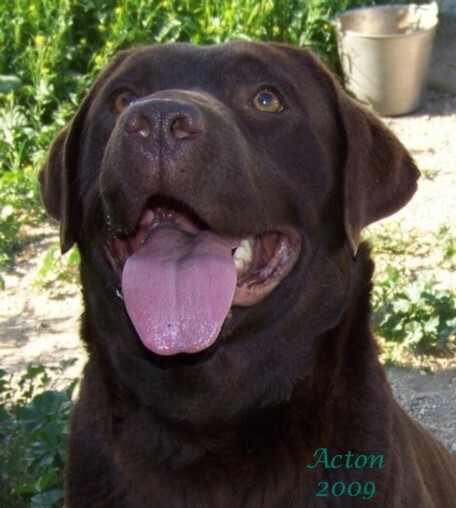 Acton is a beautiful dark chocolate Labrador and from mainly outstanding show lines of the English. Her sire is a handsome chocolate Labrador boy named "AM CH Thornwood's Resolution" from Finland, Swedish, English, and American show lines. Her mother is a beautiful black English import and from a all English show lines, her name is "AM CH Kimvalley Romantic Glances". In Acton's pedigree you will see some very impressive chocolate, black and yellow Labradors. The two English Labradors who made impact the breed in her lines are "Eng CH Sandyland's My Guy" and for the chocolate a excellent dam name "Ousmi Endless Love". Specialize in the companion Labradors for the family to enjoy. All three colors are bred here Black, Yellow, and Chocolate, a.
labradors, yellow labrador,chocolate labrador,black labrador pups,breeder chocolate labrador puppies,California servant labradors, puppies, puppy, gundogs.